Brought up in an idyllic Christian community, at the age of nine he was stunned when his family left, following internal turmoil. His stammer became a severe problem which dogged him for forty years. Unable to communicate professionally, he instead travelled and studied widely. A recent dramatic recovery has seen him appear in national Speaking finals. His readings in Jungian psychology, amidst the towering ‘god mountains’ and deep faith of Kathmandu, brought him to C.G. Jung’s final masterpiece, Answer to Job, a profound psychological meditation on the Christian Trinity / Quaternity. Jung’s insights seemed to extend to the other principal faiths in India. When he reluctantly agreed to an astrological reading, he found his Jungian studies enabled him to recognise himself in the horoscope mirror. Were the planets after all the Gods ? He rapidly moved on to discover the Kabbalah with its astrological Tree of Life which left no doubt the twelve zodiac Signs lay at the heart of the biblical tradition. This revelation began a personal odyssey to understand the mechanisms and metaphysics of astrology, the Kabbalah and especially the theology and messages of the great ancient faiths still dominating the world today. Sid Jefferies spent ten years in India researching and finally printing a pilot edition of Heaven on Earth. 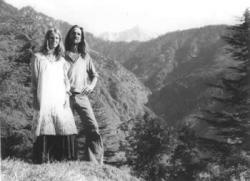 Sid and Celia Jefferies at Dharamsala in the Indian Himalayas. 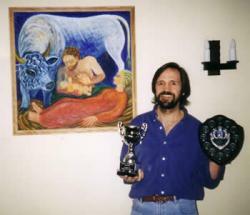 Sid Jefferies, with the ASC Speakers Club trophies he won during 2003, including Runner Up in the National Final of the Impromptu Speech competition. As a recovering stammerer, he is quite proud of this achievement.